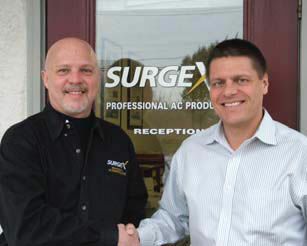 PIPERSVILLE, PA— SurgeX has merged its North American operations with Electronic Systems Protection (ESP), a leading original equipment manufacturer of power protection technology. SurgeX senior principal Michael McCook (left) and ESP president Steve Cole. The merger will extend ESP’s product line capabilities and will enable SurgeX to both expand within existing markets and penetrate new markets utilizing ESP’s resources and expanded distribution. SurgeX management will join the ESP team and by late January all product manufacturing will be consolidated into ESP’s facility in Zebulon, NC.